The second plank of evidence for the Big Bang model lies in the area of nucleosynthesis. In English, this means that the abundance of the elements seen in the universe at large matches what one would expect in a universe that began in a state that was almost infinitely hot and infinitely dense. 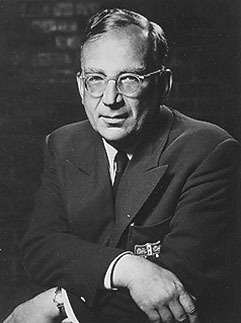 The great Russian theoretician George Gamow was one of the first to take Lemaitre’s prediction of an early universe the size of an atom seriously (see post below). However, Gamow went even further. A specialist in nuclear physics, he calculated that the temperatures in the early universe would have been too high for atoms to form. Instead, matter would have existed as elementary particles, only gradually forming atoms as the universe expanded and cooled in the first few minutes. Applying simple mathematics to the expanding universe led to a surprising result – that the matter of our universe should be composed almost entirely of the simplest two elements, Hydrogen and Helium (specifically, about 75% H and about 25% He). This prediction turned out to be correct – all the other elements of the Periodic Table account for about 0.1% of the matter of the universe! This was an impressive early victory for the Big Bang model – however, it failed to explain where the other elements came from (Gamow’s own belief that the other elements are also made in the Big Bang was soon shown to be false, as the universe cools too quickly). It was later shown that all the other elements are ‘cooked in the stars’. Essentially, what happens is this: a young star burns Hydrogen as fuel, fusing it into Helium, a process that balances the intense inward gravitational force on the star. As the star ages, it runs out of fuel to burn, becomes denser and the temperature increases. Helium then fuses into Lithium, Lithium into the next element, and so on. This process continues right down to Iron. At this point, some stars lose the battle with gravity, turning into neutron stars or even black holes. And that’s where you and I, and all the little children and everything we see about us comes from….stardust! hey cormac just posted this to fire you up..the washington post has as yet not backed down on the bad science! john kerry has entered the fray and bats back to G Will..have a read below..